ST. GEORGE — The Bureau of Land Management is offering new financial incentives to encourage qualified people to adopt one or more wild horses in an effort to find good homes for the animals removed from public lands. The program is part of the agency’s efforts to confront a growing overpopulation of wild horses and burros on fragile rangelands and in off-range holding facilities that cost taxpayers nearly $50 million every year to maintain, according to a press release from the BLM. “Finding good homes for excess animals and reducing overpopulation on the range are top priorities for the BLM as we strive to protect the health of these animals while balancing other legal uses of our public rangelands, including allowing for other traditional land uses such as wildlife conservation and grazing,” BLM Deputy Director of Programs and Policy Brian Steed said in the release. As of last March, the wild horse and burro population on public lands reached nearly 82,000, which is more than triple what the land can support along with other legally mandated uses. 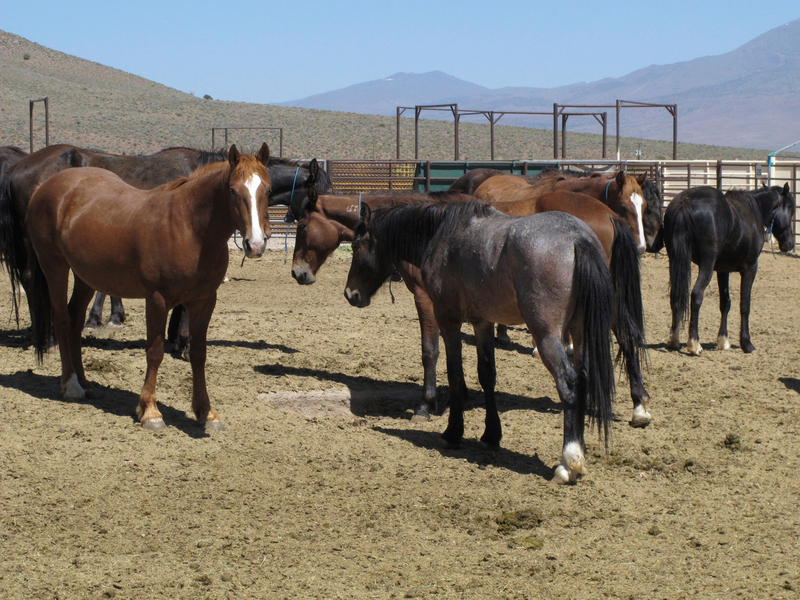 The high costs and a growing number of unadopted and unsold animals in BLM holding facilities have hindered the agency’s ability to reduce overpopulation in recent years. Additionally, chronic overpopulation increases the risk of damage to rangeland resources through overgrazing and raises the risk of starvation and thirst for animals in overpopulated herds. Through the new incentive program, qualified adopters are eligible to receive $500 within 60 days of the adoption date and an additional $500 within 60 days of titling each animal, which normally occurs one year from the adoption date. “We understand that adopting a wild horse or burro represents a commitment. The incentive is designed to help with the adopter’s initial training and humane care,” Steed said. This incentive is available for all animals that are eligible for adoption, including animals at BLM facilities, off-site events or on the agency’s Online Corral website. Adopters will just pay the minimum adoption fee of $25 per animal. Those interested in adopting are required to complete an application to prove they can feed and provide humane care to the animals and that they will adhere to the prohibited acts and titling requirements. 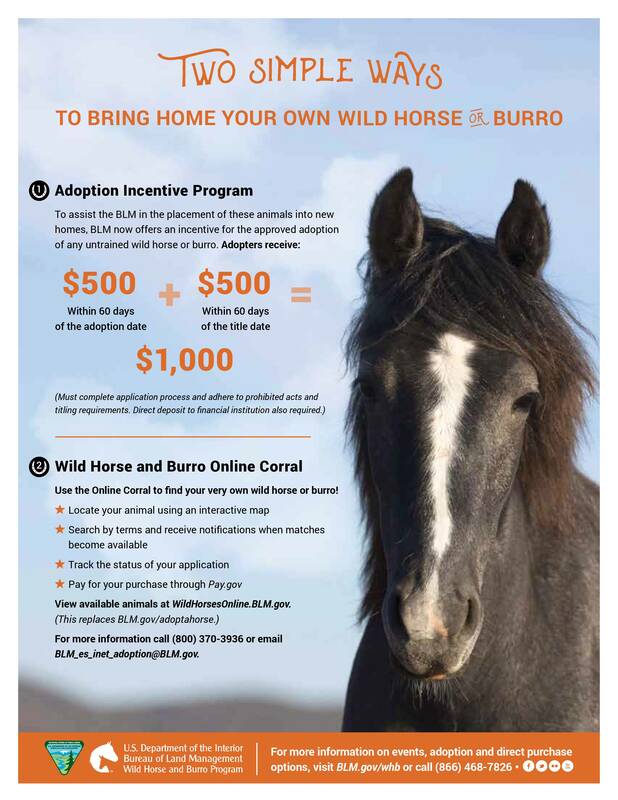 In addition, potential adopters must authorize the incentive to be deposited via electronic funds transfers to their preferred account at their financial institution, and those interested can visit the BLM website or call 866-468-7826 to learn more about the guidelines and requirements for adopting a wild horse or burro. The BLM manages and protects wild horses and burros under the authority of the 1971 Wild Free-Roaming Horses and Burros Act. The Act directs the BLM to address overpopulation by removing excess animals from overpopulated herds and offering them to the public for adoption or purchase. “I encourage anyone who has considered adopting a wild horse or burro to join the thousands of owners who have provided good homes to more than 245,000 wild horses or burros since 1971,” Steed said. Owning a wild horse or burro is an extraordinary experience, and the animals have gained prominence through disciplines such as dressage, endurance and therapeutic programs that help veterans fulfill a new mission. Additionally, wild horses and burros are routinely preferred by public officials for important tasks such as patrolling the border and local policing. For stories from recent wild horse and burro adopters and purchasers go to the BLM’s Flickr page.